« Does a Shepherd Leave His Sheep Alone? How Shall We Live in A House of Murder and Lies? Christ says that the devil is the prince of this world (John 14:30; 16:11); and he is a murderer from the beginning and a liar (John 8:44). If, then, we would live upon earth, we must realize that we are guests and lodge in an inn with a knave as host and with a sign over the door that reads THE HOUSE OF MURDER or THE HOUSE OF LIES. Satan is a murderer for killing the body, a liar for misleading the soul. That is the devil’s trade and his work; that is the way he keeps house; that is how business is carried on in this inn. Whoever belongs to his followers must lend him a helping hand. But whoever is his guest must expect and risk experiencing rough treatment. (Martin Luther) Q: What does this say to you as a Biblical, pro-life Christian? How do you respond? The devil, too, can quote Scripture and deceive us with it. But his use of Scripture is defective. He does not quote it completely but only so much of it as serves his purpose. The rest he silently omits. (Luther) Q: What does this mean for pro-life Christians and caring pregnancy centers that seek to work with churches, pastors, and youth groups? At all hours the devil is seeking to kill us all. After you have been baptized, he will not let you have any rest. If he could kill you in your mother’s body, he would do it. (Luther) The devil does not despise God so much as he despises the humans that God so dearly loves. For it is to us that God gives dominion over Satan. Q: What does this tell us about the intensity of the pro-life/pro-abortion debate? Do you think most Christians recognize legalized abortion as spiritual warfare? All sadness is of the devil, for he is the lord of death. But, God does not sadden, or terrify, or kill. He is the God of the living. This is why He also sent His only-begotten Son, not to terrify but to console. Christ also died in order to be Lord of death and to give us life and destroy death. “Rejoice, be confident, be glad. I have overcome the world and death” (Jesus in John 16:33). The devil gives heaven before sins have been committed and despair afterwards; Christ does the opposite and gives heaven after the sins. (Luther) Q: How does this Truth set caring pregnancy centers and post-abortion ministry apart from Planned Parenthood? I have read that a man who could have no peace because of the devil made the sign of the cross on his chest and said, “The Word was made flesh,” or, what amounts to the same thing: I am a Christian. 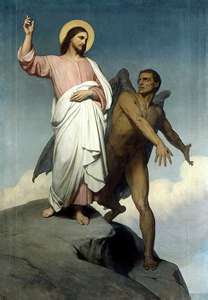 Then, the devil was defeated and chased away, and the man had peace . . . One does not gain much ground against the devil with a lengthy disputation but with brief words and replies, such as: I am a Christian, of the same flesh and blood as is my Lord Christ, the Son of God. Settle your account with Him. (Then the devil does not stay long.) (Luther) Q: What does this say to you as a Christian living in this world? When the devil comes during the night to plague me, I give him this answer: Devil, I must sleep now; for this is God’s command: Work during the day, sleep at night. If the devil persists, and now accuses me of more sins, I reply: Satan, I have heard the record, but I have committed still more sins which don’t even stand in your record. Put them down, too. (Luther) Also, say to the devil: Just by reminding me that I am a poor, miserable sinner, you are placing a sword and weapon into my hand with which I can decisively overcome you . . . if you tell me I am a sinner, I can tell you that Christ died for sinners. To Him I direct you.” (Luther) Q: How does this affect the way you parent, mentor, witness, teach, serve others, and stand “for life” in this world — Satan’s “house of murder and lies”?